Hepler’s sources of inspiration include ephemeral natural phenomena such as flocks of birds and underlying mathematical patterns found in shells or plants. By combining visually cohesive, solid forms, such as an oval or a sphere, with contrasting smaller particles or units, she takes on the duality she sees in nature’s systems. 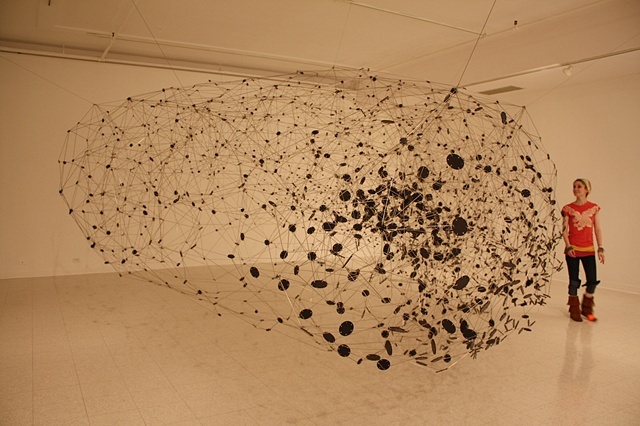 In one area of her work, the artist is interested in elemental shapes that nevertheless contain a chaotic structure– tangles of thread, electronic circuitry, swarms of insects in flight. “There is something terrifying about their massive intricacy and something beautiful in the rhythms of their minute and repetitive detail.”3 Hepler combines the idea of the swarm with an interest in skeletal frameworks either from the natural or built environment.